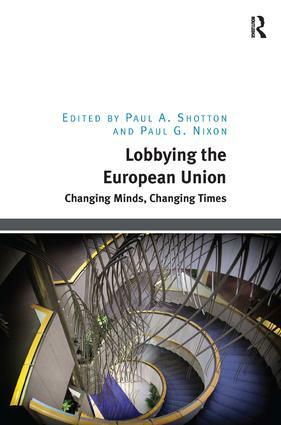 Unique in bringing together contributions from academics and practitioners on the theme of strategic, intelligent modern lobbying this book provides a thorough and accessible discussion on key ideas pertinent to the pursuance of public affairs in the European Union. Combining innovative academic research with first-hand professional experience it offers the reader a combination of practical recommendations, case studies and academic theory to add new insights to interest group research and lobbying strategies. While focusing on the European Union the contributors acknowledge the multi-level dimension of EU decision-making and incorporate research on multi-level governance as well as lobbying by sub-national authorities. Through this they present a fuller picture of a subject that should appeal to students, academics and practitioners alike. Contents: Introduction, Paul G. Nixon and Paul A. Shotton; Change and continuity in the composition of the lobby community in the European Union: lobby explosion and lobby tourism?, Joost Berkhout; Issue areas, political arenas and interest groups, Anne Skorkjær Binderkrantz and Helene Helboe Pedersen; Evaluating pluralism: interest groups’ policy demands and lobbying success in the European Commission’s open consultations. A case study in environmental policy, Adriana Bunea; Outnumbered, but not outgunned? The participation of citizen groups and business interests in national and EU level consultations on EU policies, Rainer Eising; Regions lobbying the European Union: organizational forms, policy portfolios and venue selection, Bert Fraussen and Tom Donas; Privileged access to the European Commission's stakeholder consultations, Henrik Hermansson; Social media and the politics of interest representation, Paul A. Shotton and Adam W. Chalmers; A practical guide to European Union lobbying campaigns, Natacha Clarac and Stéphane Desselas; Advocacy 3.0: adapting to a new public policy paradigm, Tom Parker and Gabriel Gonzalez; Changing nature of public affairs agencies: the role of ‘thought leadership’, David O’Leary; Public affairs case study: The Centre - Brussels’ first think-do tank, Martin Porter; European Union think tanks and public affairs: a fine line between independence and advocacy, Hans Martens; Conclusion, Paul A. Shotton and Paul G. Nixon; Index. Paul A. Shotton spent ten years working in Brussels as a public affairs professional. During this time he worked for the media, trade associations, campaign organisations and in consultancy. As Principal Lecturer at The Hague University’s Programme for European Studies he lectures, researchers and heads the Department for Public Administration. His current research focuses upon the role and impact of social media in advocacy as well as agency problems faced by lobbying organisations. Paul G. Nixon is a Principal Lecturer in Political Science and Head of Research at the Programme for European Studies, The Hague University of Applied Sciences. He has experience of a number of European Union projects such as GAIDA and COST-14 projects in the broad areas of democratization, transparency and the media. He has edited a number of collections and contributed chapters to others on the use of ICTs particularly in the fields of political parties, electronic democracy and social welfare.